Quick. 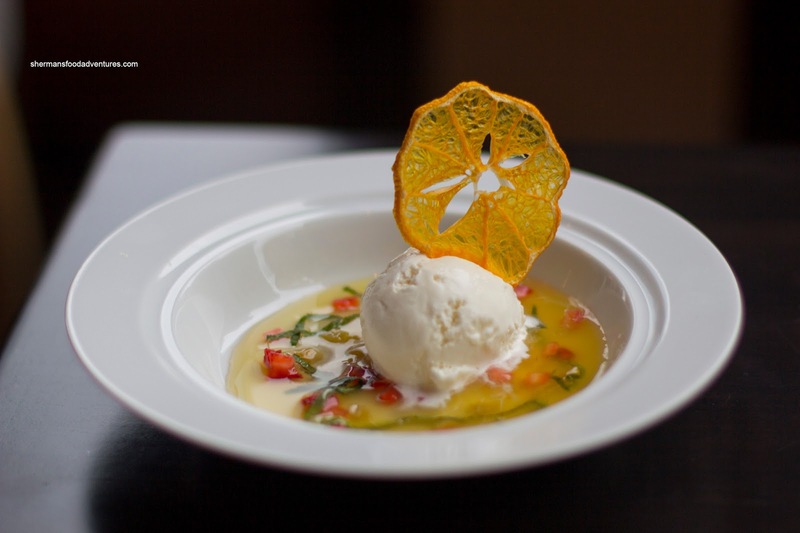 If you had to name some of the best Hotel restaurants in town, what would come to mind? Market, Tableau and Diva at the Met would be some of the obvious choices. 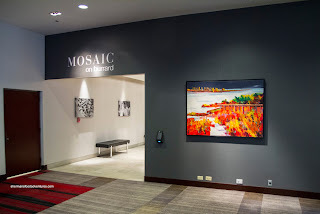 Quietly, Mosaic in the Hyatt Regency has crept into the discussion. I remember visiting it in the past and yes, it served safe hotel food. Now under the direction of Executive Chef Thomas Heinrich, the Hyatt Regency aims to offer up an interesting and modern take on food in general. I was given the opportunity to drop by to try one of their tasting menus (which change every 2 weeks) on their dime. So Viv and I decided to check out the Spot Prawn tasting menu (running until May 29th). The first course actually had nothing to do with the tasting menu since Chef Heinrich wanted us to sample items off their regular menu as well (I'll talk about them first). 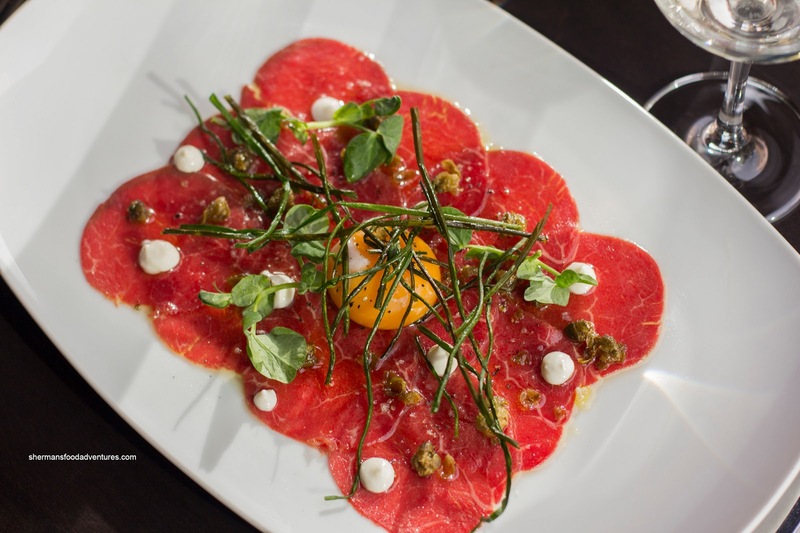 Arriving attractively plated, the melt-in-our-mouths Spring Creek Beef Carpaccio was attractively plated with smoked olive oil, fried capers, horseradish aioli, pea greens, fleur de sel, fried chives and a 64 degree egg. Everything seemed to have a purpose on the plate either providing a crunch, acidity, texture and of course flavour. However, the fried chives could've been made into smaller pieces as they were a bit hard to eat and busy to look at. With an interesting smear of green garlic grits, the Seared Ocean Wise Baja Scallops displayed a deep shade of brown which added smokiness and nuttiness. They were delicate and naturally sweet. The grits were mild with only a slight garlic aroma. 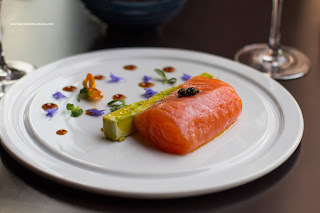 Our favourite dish of the night had to be the Warm a la Minute Smoked Skuna Bay Salmon with an avocado and sour cream terrine accented with caviar, edible flowers and maple bourbon fluid gel. 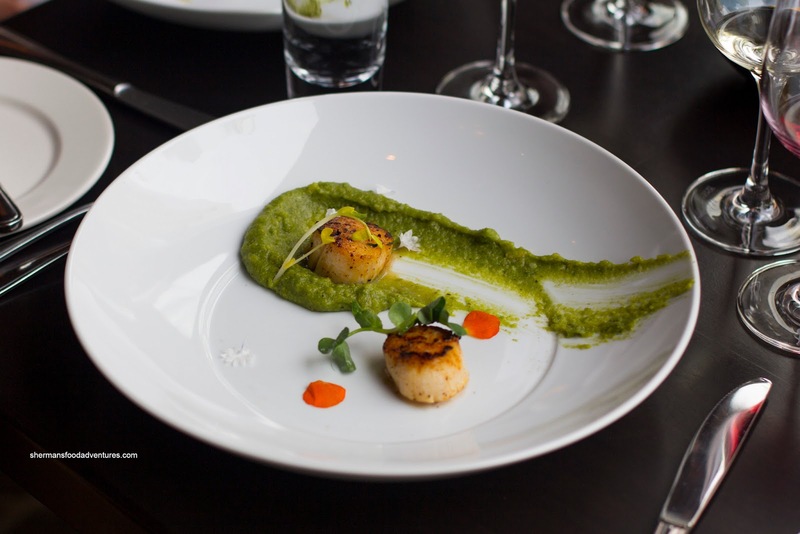 The plate was served with a glass dome which revealed actual smoke that tickled the senses. The salmon itself was buttery soft with the gentle flavour of smoke. It went really well with the tartness of the avocado sour cream. 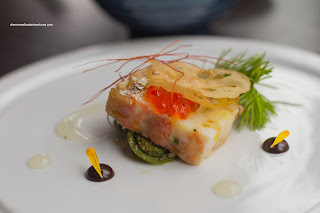 Now onto the actual spot prawn tasting menu, we started with the Sport Prawn Terrine with fermented black garlic, citrus fiddlehead ferns, meyer lemon fluid gel, schooner caviar, fried lotus root chip and fresh pine that had a woodsy lemon aroma. The prawns were naturally sweet and just barely cooked. The lemon gel and black garlic were complimentary together while the ferns were really tart. This was paired with a glass of Las Perdices Torrontes which was peachy with floral undertones. 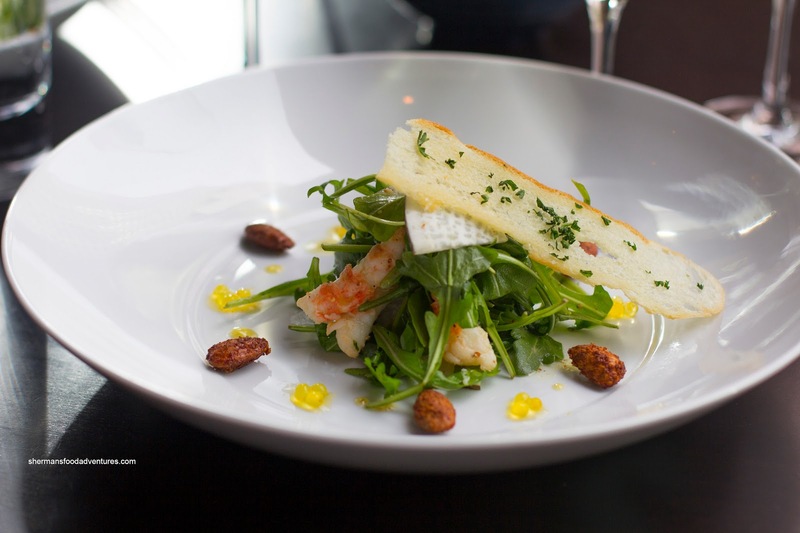 Onto the Spot Prawns & Arugula Salad, it included black radish, spiced almonds, crostini and citrus caviar. This was pretty straightforward with nicely cooked prawns and peppery bitter arugula which were accented by the crunch of the flavourful almonds and the firm radish. This was paired with the familiar Quail's Gate Chardonnay which was again quite floral and smooth. 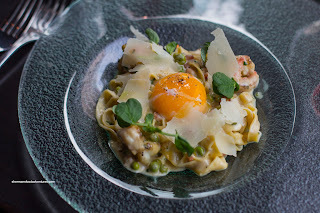 From light to heavy, we had the Spot Prawn Carbonara next with fresh al dente linguine, Geldermen Farms organic bacon, peas, cream, white wine, herbs, garlic, truffle oil, Parmesan and a 64 degree egg. This was very rich and silky due to the cream and egg yolk. There was considerable punch from the bacon bordering on salty but was somewhat balanced by the sweet prawn and peas. With the egg yolk, there could've been a touch less cream as the pasta was very saucy. Cutting through the richness was the accompanying glass of Prospect "Rock Wren" Pinot Noir which was woodsy and surprisingly light. Onto to some surf & turf, we had the Spot Prawns & Spring Creek Beef with a pomme maxim, fava beans and demi. The beef flank was sous vide first and it was sufficiently tender for the cut of meat. It was done medium-rare as requested. The beef on its own was a bit on the salty side while the spot prawns were of course sweet and delicate. 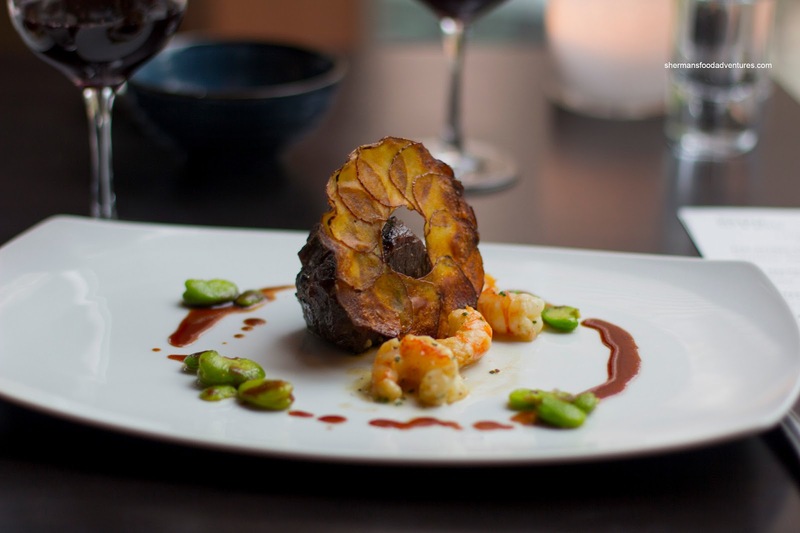 A glass of Finca Flichman "Misterio Malbec went well with this dish as it provided an oaky fruitiness. The meal finished off with a light Tangerine Consomme with mint, strawberry, rhubarb, vanilla ice cream and tangerine chip. As expected, it was tart, sweet and refreshing. Loved how the mint added an extra layer of brightness to the dessert. This was served with Chateau Des Charmes Vidal Ice Wine which was predictably sweet and floral. 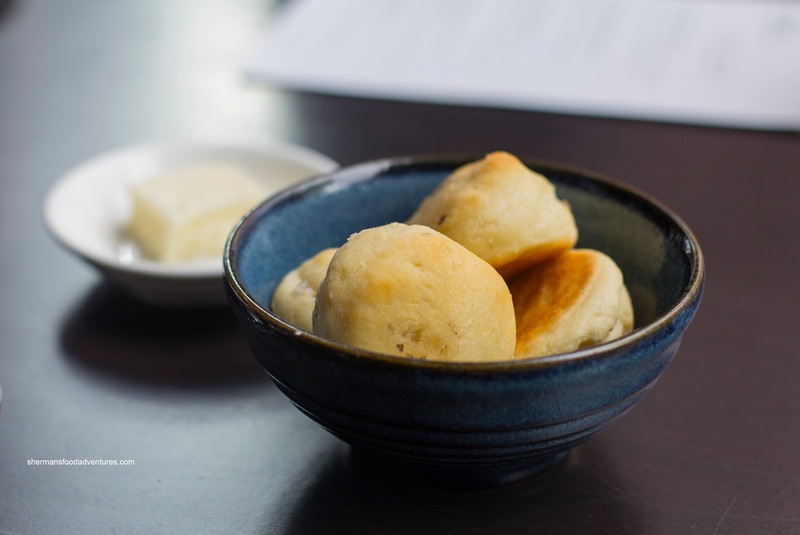 Overall, we found the tasting menu to be both satisfying and incredible value at $45.00! If you opt for the wine-pairings, it is only $65.00. One of the best tasting menu values in my books.